The first two days of school are done, and I feel a bit done in myself. Not once over the summer did I have to check the clock to see how soon I could use the bathroom or eat. Summer vacation is already a distant memory. But 178 days of “teachable moments” await! As a kid, I loved going back to school. Okay, make that elementary school. You couldn’t pay me to repeat middle or high school. I loved the ritual of buying the new notebook and a new box of 48 Crayons (my parents were too cheap to spring for the box of 64 with the built-in sharpener). I loved wearing my new long-sleeved plaid “Back to School” dress, even though on the first day of school the classroom was a sauna. I can also recite the names of ALL my teachers – up until the seventh grade. That’s when the hormones kicked in and their names and everything else got all blurry. The first day of school is a teacher’s chance to make a big first impression. Every teacher wants students to go home and tell their parents how GREAT their new teacher is. At the same time, you can’t be a push over. You want to make a big splash, but you don’t want it to be a belly flop. No one could get away with doing that now. Actually, I’m surprised a teacher got away with doing it THEN. But it left a lasting first impression, and it was a positive one. The first day is all about teaching the new students classroom procedures. How to sit. How to stand. How to walk in a line. How to raise your hand. 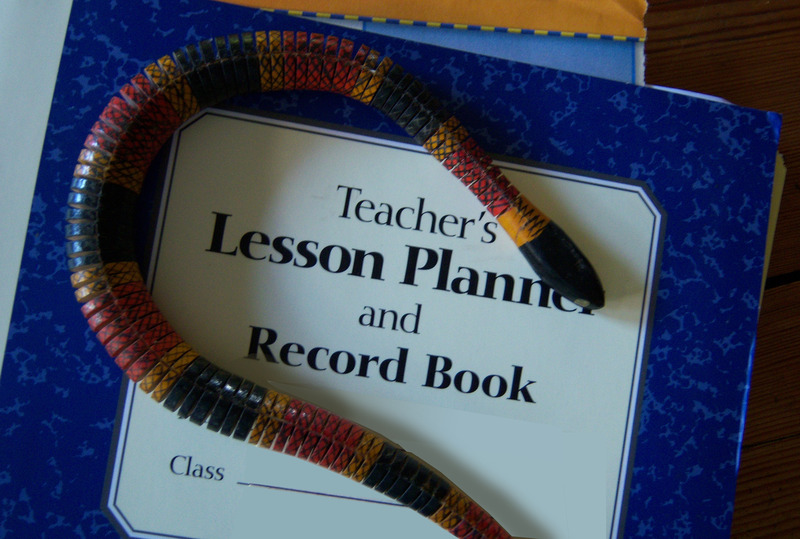 (The common thread being – how not to drive your teacher crazy.) Sometime after lunch on that all important first day of school, I realized I was beginning to bore even myself. I’m easily amused, so this was a serious offense. The air-conditioner in my classroom is there for one purpose – to mock me. When the students came back after lunch, I had the lights off to trick them into believing it was cooler inside than out on the blacktop. Then I flicked the lights back on and had them sit on the rug, so I could read them a story. Oh, it felt good to finally sit down. I love to read aloud, and the children listened attentively. They raised their hands and made predictions and comments at just the right times. In short, we were having a good time. When I finished the story, someone mentioned something about being afraid of a snake. Someone else chimed in that they were afraid of bugs. Now according to my plan book, the next thing we were going to do was write a paragraph about My Summer Vacation (I am seething with original ideas! ), but I saw an opportunity. “Who’d like to sit and talk about stuff that scares us?” I asked. All hands shot up. “Let’s pretend we’re sitting around a campfire on a cool night,” I said. I had the children form a circle. My mind was now racing. “We’ll need a campfire!” I grabbed some orange and red tissue paper and wadded it up so it vaguely resembled a campfire. Then I switched the lights off. “I like this fire because it won’t make us hot,” I said. “But we can’t roast marshmallows either.” The kids giggled. Each child was to introduce themself: Hi, My name is _________ and I’m afraid of __________. If someone didn’t feel like sharing, they could just do the introduction. They began. “I’m afraid of snakes.” “I’m afraid of the dark.” ” I’m afraid of bugs.” Those were the big three. One boy was afraid of heights, and then there was the kid who said, “I’m afraid of the movie Saw 3. Whoa! Who’s letting their eight year old watch THAT movie? Three children said, “Pass.” One boy bragged that he wasn’t afraid of anything (there’s always one, but he had yet to see my face when you tell me you didn’t do your homework). One little girl, who only speaks Korean, had her friend translate. When everyone had shared, we talked about our fears. One boy, one of those scientific types that I love, informed the other students that most snakes are not poisonous, and snakes are actually quite helpful because they eat garden pests. The kids were impressed. We agreed that everything is scarier when it’s dark, but agreed no one was scared sitting in our darkened classroom because we had each other. “Do you know what scares more people than anything?” I asked. When the answer wasn’t snakes, the kids were stuck. I told them the thing that scares people most is getting up in front of other people and talking. And yet they’d just spoken in front of their classmates on the very first day of school. They were all smiles. They had good reason to be proud of themselves. This was just the first of many lessons they will learn in third grade. Sometimes, the most important lessons aren’t the ones in the plan book. And first impressions DO count. I realized this year’s class was off to a good start. Then I turned the lights back on.